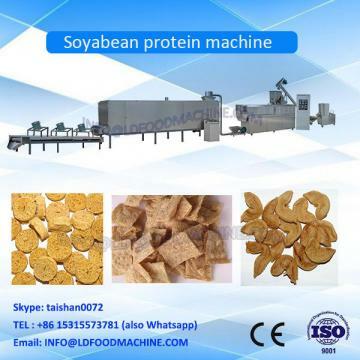 Textured soya protein machine (TSP) adopts defatted soybean and soybean protein isolate as main materials. This processing line depends on extrusion technology by double screw, changes x-protein into silk protein under high temperature and pressure. Protein molecule can orient in the fibre direction, form one fibrous vegetable protein like the texture of meat fibre after extrusion and hardening. Because of perfect absorption of water and oil, TSP can be processed into vegetable food with different flavor or mixed into other foodstuff like Soya chunks production line, ham, burger, meat stuffing of frozen dumpling etc.